Today she is teaching me the Korean way to make Kim Chi. We start by quartering the cabbage and liberally sprinkling it with coarse sea salt. 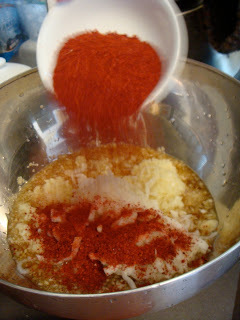 Adding a bit of water to the bowl makes a nice salty solution for it to tenderize in. We grate the turnip, salt and soak it also. Let both sit for about an hour, turning occasionally. Next, we boil 3 cups of water, adding 1 cup of rice flour and allow it to thicken and bubble, at which time we add ¼ C of sugar. Pulling it off the heat and allowing it to cool gives us time to blitz 3 tbsp ginger, 1 C garlic and 1 C onion. To our ginger mixture, we add 1 C fish sauce, 2 C red pepper powder (makes medium spice), chopped green onion, rinsed grated turnip, and the thick rice flour mixture. 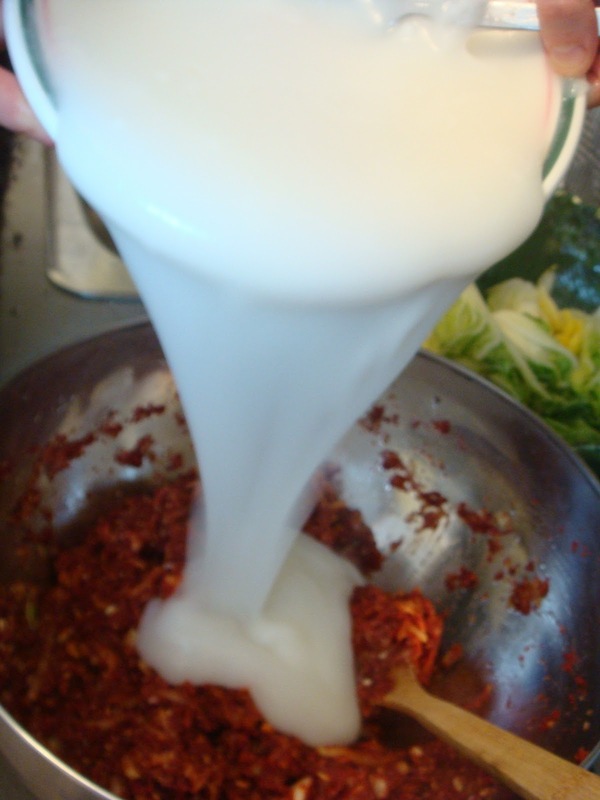 This makes the paste for our Kim Chi. 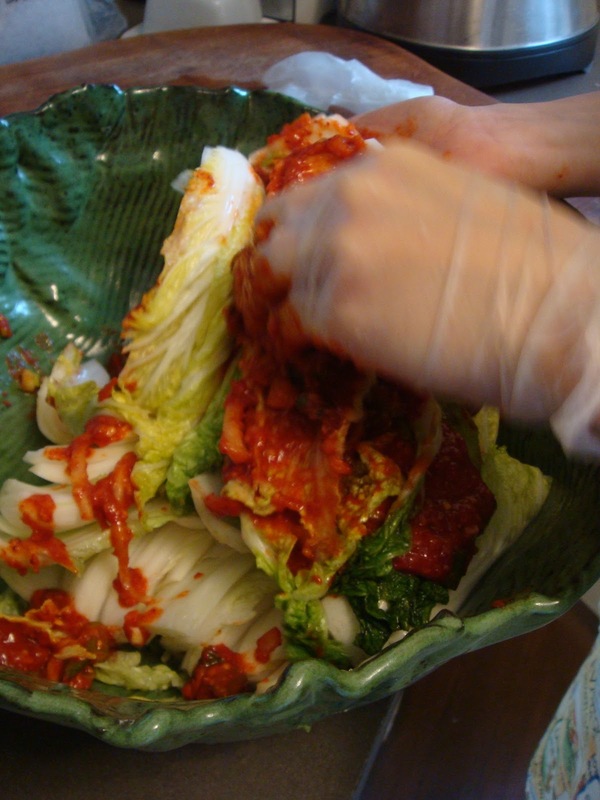 Finally, we rinse well the cabbage, cut off any dead parts, and begin to spread between leaves, a thick layer of the spicy sauce. 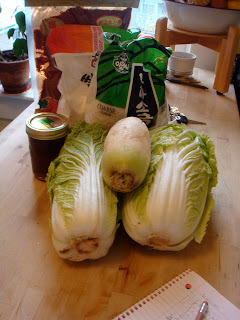 Each quarter of cabbage can be pressed into the bottom of the jar, ridding it of air, and making sure everything is in close contact with each other, like a hot Korean sauna. 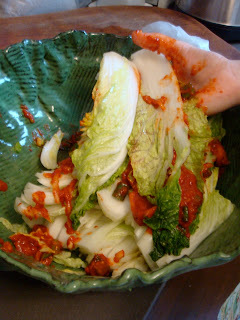 Refrigerate, and wait one to two weeks, until ready.